When it comes to shopping for flooring in Central Indiana, you have plenty of choices - let us tell you why Kermans is the best flooring store in Indianapolis. As one of the largest flooring stores in Indiana, Kermans has advantages that we are happy to pass on to our customers. When you shop at Kermans, you'll find high-quality, affordable flooring as well as high-end, luxurious brands to fit any need and budget. Learn more about the Kermans Advantage. Kermans has been a fixture in Indianapolis since 1921 when Robert Benjamin opened the doors of Kerman Oriental Rug Company. Today Kermans is run by the third generation of the Benjamin family and has expanded to become one of the premier flooring stores in Indiana. Our decades of experience and consultative approach to serving customers has made us the best choice in flooring for Indianapolis families. 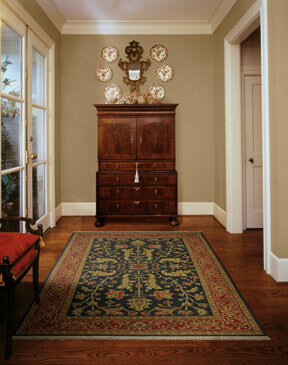 Learn more about what makes Kermans your best choice for flooring in Indianapolis. with any hardwood purchase totaling $2,000. Where you purchase your flooring really does makes a difference. We invite you to experience our customer service, see our selection and meet our family for yourself. Stop by our showroom, located at 4505 E. 82nd Street on the north side of Indianapolis to shop for the leading floor manufacturers with prices at any budget.